Nicki Minaj Leaked D’Angelo Russell’s Nick Young Tape Over Iggy Azalea Beef? 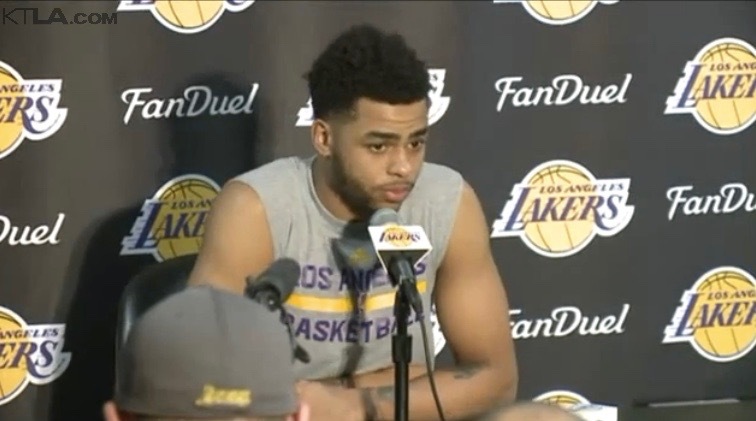 *After D’Angelo Russell secretly recorded his Los Angeles Lakers teammate Nick Young divulging his sexual activity outside of fiancée Iggy Azalea, the player has apologized over and over; and one source is claiming that Nicki Minaj’s camp is behind the video’s leak to social media – due to her ongoing beef with Azalea. As previously reported, Russell, 20, is said to have been ostracized by his teammates, who no longer trust him. Speaking before Wednesday night’s home game against Miami, Russell apologized profusely for recording the video, saying his actions have created ”a bad vibe” on the last-place team. Russell also acknowledged that the video might have ruined Young’s relationship with Azalea. In Russell’s video, the 20-year-old point guard asks Young about being with women other than Azalea. Russell claimed he has no idea how the video became public, claiming he didn’t post it on social media or send it to any friends. According to ESPN 97.5 Houston, Nicki Minaj’s camp masterminded the whole video leak, recorded from Russell’s Snapchat. Apparently, it was an act of revenge after Iggy took some shots at Minaj on Bravo’s “Watch What Happens Live” last week, claiming Nicki didn’t write her own rhymes. Meanwhile, Lakers fans D’Angelo Russell have it during pregame introductions and in the opening minutes against the Miami Heat Wednesday night. Some reportedly shouted ”Snitch!” and ”Traitor!” from the stands at Staples Center. Russell disagreed with claims that his teammates have isolated him, but he knows they aren’t happy. Young was uncharacteristically downbeat in his own brief comments before Wednesday’s game. Russell said he intended the video to be part of their supposed back-and-forth pranking, claiming Young was among his closest friends on the team. Russell acknowledged saying ”crazy things” in his daily conversations with Young, but claimed the video wasn’t a prank gone wrong. Bad things happen to everybody. It’s very unfortunate that it happened the way that it did. Whomever or however the information got exposed was wrong and damaging to all involved. If the information was exposed for a harmful purpose, nothing good comes from harming someone else, or from hurting other people. Hopefully, there will be a lot of self inventory going on behind the scenes. We all have flaws. We all have weakness. We all make mistakes. We are human beings. Human beings make mistakes, because human being are NOT perfect. And perfect relationships, perfect marriages DO NOT EXIST. Iggy is a non factor. It makes me sick this site is giving someone who clearly appropriates our culture any space. How about a positive story about a young BLACK woman instead.